This DSLR came to me in a little market in Barcelona called Encantes, wich is open 3 days a week. At first I though it was a good thing to buy as the camera hadn’t any scratches or visual defects. It cost me 15€ so it was worth of buying it even if was broken. Actually I tried to power up the camera by soldering a pair of cables to the battery attachment and feeding them with the 7.4v that its original batteries supply. After a few tries an multimeter measures I ended with a diagnose of broken power supply board. It costs about $40 to replace it but I’m not totally sure about if the rests of components will be properly working, plus the camera is 10Mpx, made in 2007 and has smaller 4:3 image sensor format, wich is poorly on high ISOs, so I decided to tear it down. The MOS image sensor (big center colored square) is mounted over 3 frames. The first, image sensor frame moves in vertical axis meanwhile the second frame moves in horizontal axis. 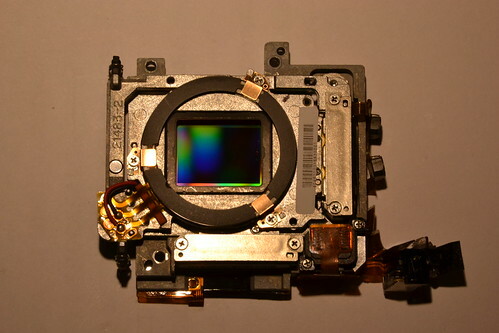 The third and outside frame is fixed in the camera. This conforms the IS (image stabilization) system of this camera that works regardless the lens you use on it. The bad thing about image sensor stabilization is that stabilizes image only for the final photo and live view, leaving the image unstabilized when looking in viewfinder and light/autofocus sensors. Overall, is a really nice technology piece as the frames are moved with ultrasonic motors. Esta entrada fue publicada el Viernes, 28th Junio, 2013 a las 4:08 pm	y esta archivado bajo Cacharros. Puedes seguir cualquier respuesta a esta entrada a traves de de la alimentacion RSS 2.0. Puedes dejar un comentario, o hacer un trackback desde tu sitio.